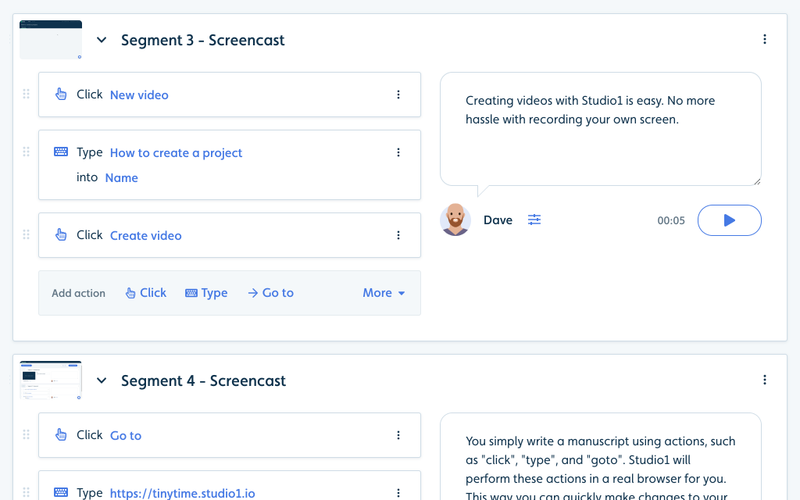 With Studio1 you create manuscripts describing how to perform and narrate your screencasts. Manuscripts consists of actions such as "Click", "Type", "Go to" and more. Studio1 renders videos by automatically performing these actions for you. This creates a smooth, error-free video without funny mouse movements or clumsy keyboard fiddling. Videos can be rendered again, over and over, as your software evolves. Studio1 comes with a point-and-click interface to quickly create new manuscripts. It works very simply: From within the Studio1 interface you control a remote browser using your mouse and keyboard. 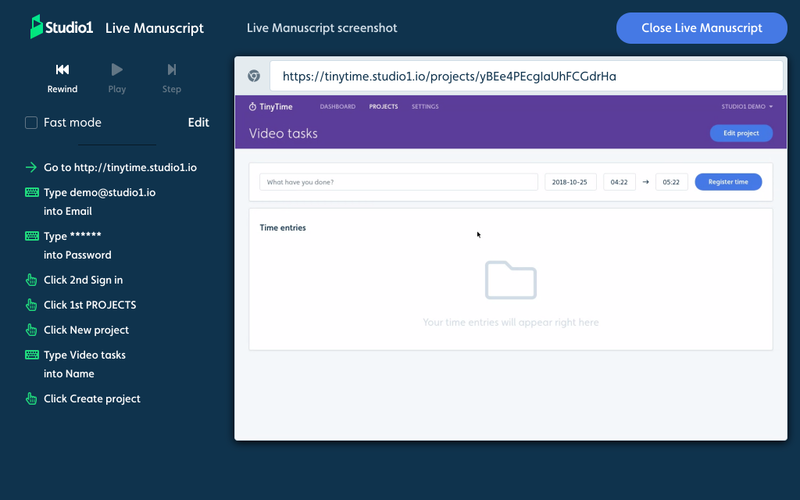 Live Manuscript tracks all the clicks and key presses you make and automatically adds them as actions to the manuscript. Studio1 can repeat exactly what you did, when rendering the video, except Studio1 will move the mouse smoothly, avoid typos, and synchronize screencast actions with your voice-over. Get high-quality voice-over through the power of Text-to-Speech by Google. Just enter the text you want it to say, and almost-human-sounding voice is synthesized for you immediately. 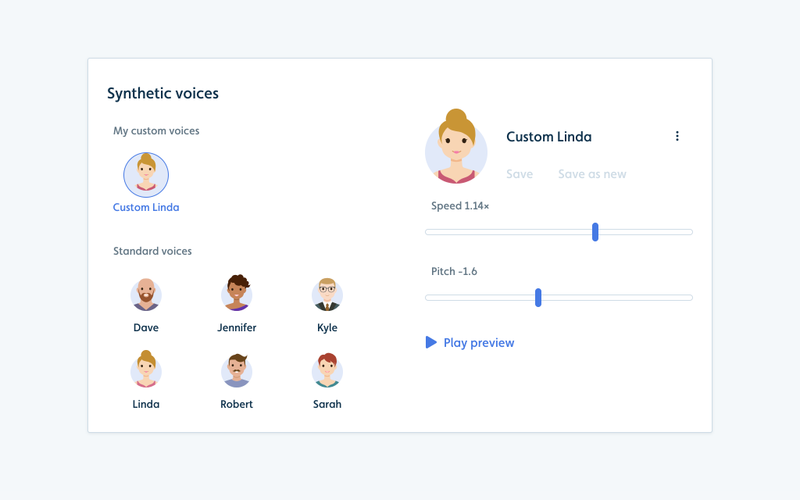 Synthetic voices offer clear speech with quick results providing you with the ability to easily adjust wording based on customer feedback. This also saves you a lot of time while keeping your videos current. If you'd like something more personal than a synthesized voice, you can record your own voice directly in Studio1's interface using your microphone. 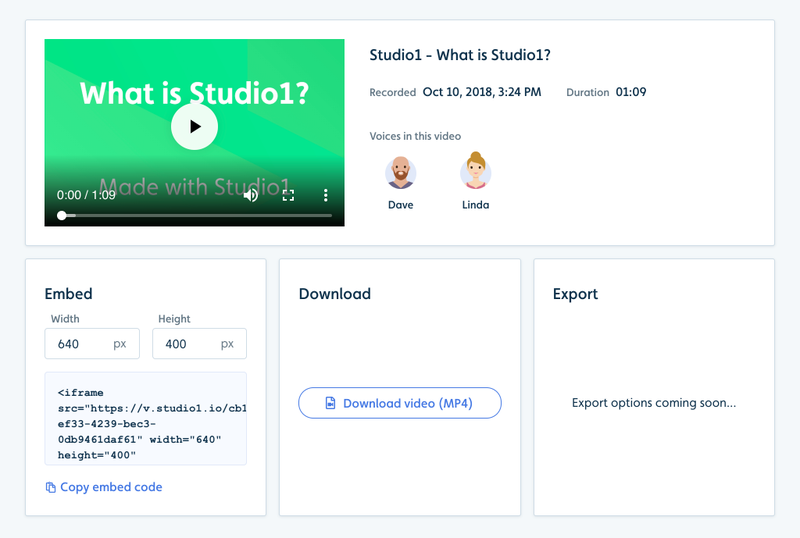 Studio1 will automatically trim the audio clip to remove any silences in the beginning and end, which makes it easy to achieve synchronicity with the visual screencast actions. You can also upload sound files, if you e.g. get audio from a professional voice-over company. Splash screens are used in videos as intro- and outro segments. 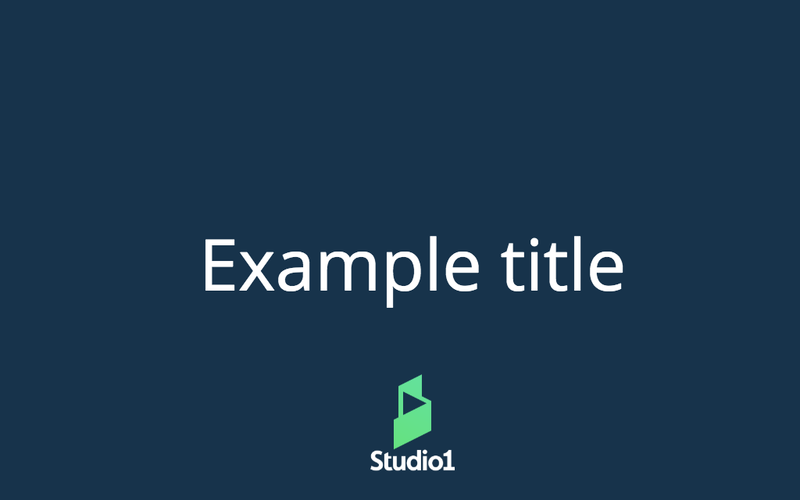 Example: The title of the video, your company's brand color as background, and your company logo. Templates can be customized. They're just HTML, so you can achieve any look you want. You can also use animations such as fading in from black or sliding text in/out, which makes your videos more lively. 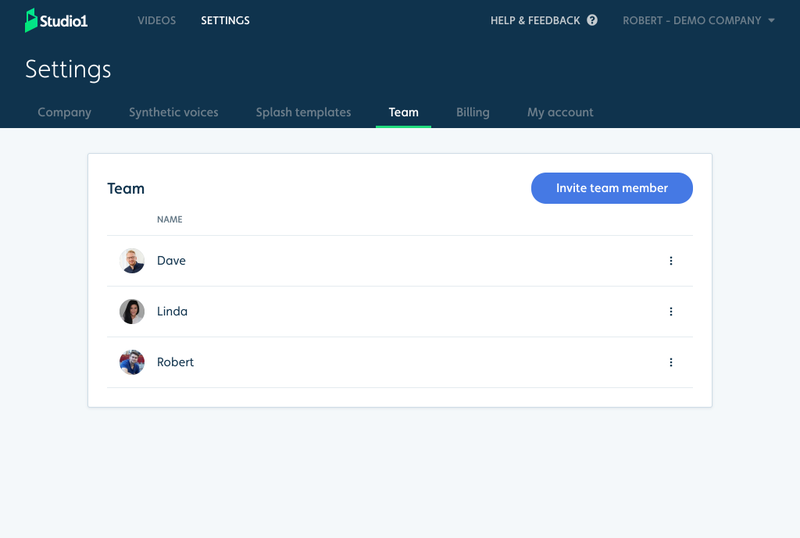 You can invite all your coworkers to collaborate with you on Studio1. With manuscripts stored in Studio1, no single person holds the key to creating and maintaing your videos. When new people join your company, they don't have to look in old archives or start from scratch when making new videos. Simply pick up from where others have left off to update or re-render videos. The benefit of using reproducible manuscripts is that you can easily re-render videos again later. This is super useful when your app's design or major navigation patterns change. 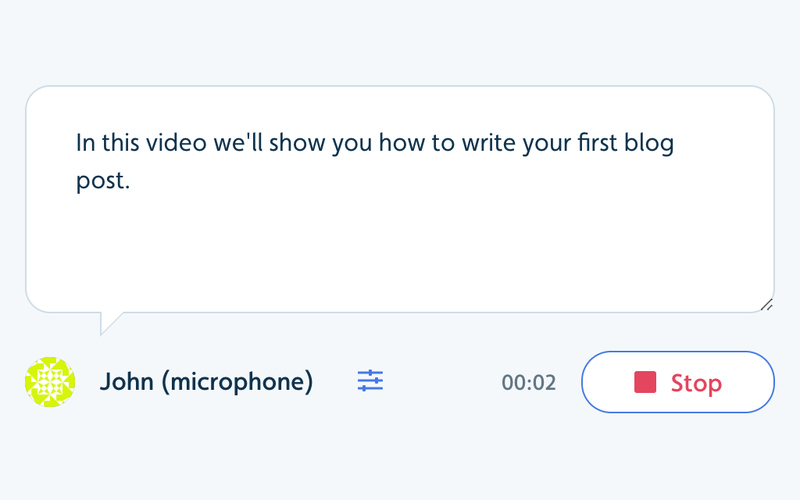 This also enables you to make small incremental improvements to your videos without having to re-record everything from scratch, saving you time. 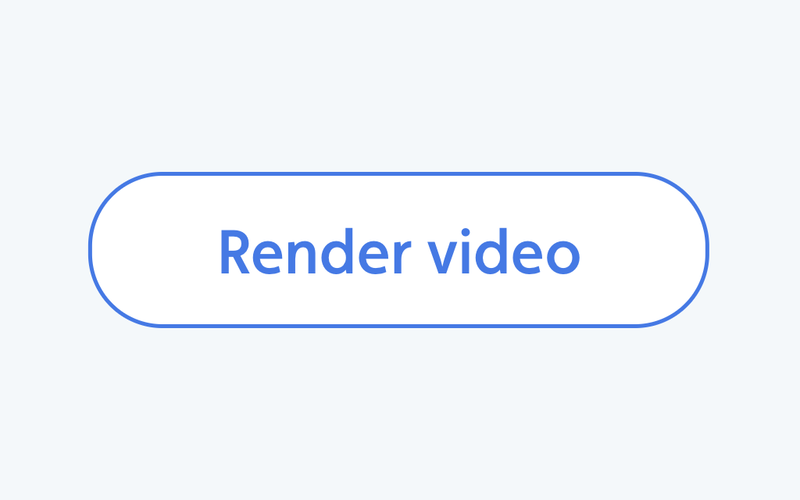 You can embed your videos on your website using our tiny HTML snippets. You can also download your videos in raw mp4 format. Soon you'll also be able to export videos directly to hosting services such as YouTube, Wistia and Vimeo.